Watch in awe as Dr Greene’s unusual experiments and frankly disturbing ingredients produce some truly astonishing results. 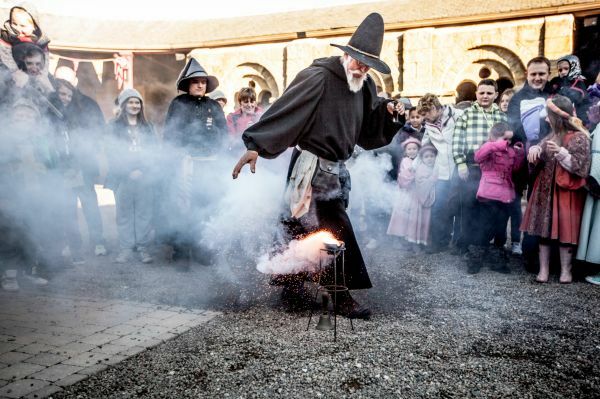 From grand explosions to deadly potions and icky materials, this medieval sorcery is bound to cast a spell on you. But be wary, as not all is what it would seem! Will he be able to turn young dragon’s blood into bountiful chunks of gold? Will he blow up Artisans Courtyard with his mischievous ways? Will we ever find out if he’s a scientist, magician, charlatan or downright madman? Dr Greene’s magnificent alchemical experimentations will leave you dumbfounded, whilst providing a fascinating insight into this remarkable science which grew in popularity during the medieval period. The 9th Earl of Northumberland (1585-1632) became particularly fascinated by the wonders of alchemy - the study of how to turn base materials into gold, as well as the pursuit of the creation of the Philosopher’s Stone. During the 9th Earl’s imprisonment within the formidable Tower of London, he nurtured his alchemy interests and allegedly performed many experiments which earned him the title of the Wizard Earl. His curiosity led to a notable collection of scientific manuscripts, forming the basis of the library which exists at Alnwick Castle today. Alnwick Castle welcomes the bizarre Dr John Greene between the 19th – 22nd April 2019 and 27th – 31st July 2019, so why not join us for this fun filled family adventure which is free with admission to Alnwick Castle!